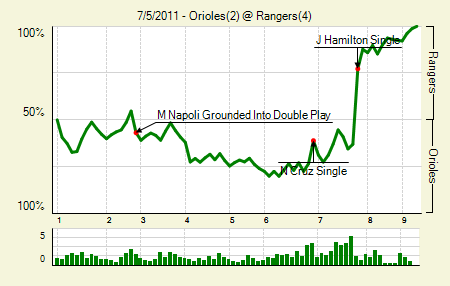 Moving the Needle: Josh Hamilton drives home one, and gets help bringing home another, +.403 WPA. Down 2-1 in the seventh, Hamilton came up with runners on the corners and two out. He smacked one into left to bring home the runner from third. The trail runner slid into third, but Mark Reynolds couldn’t hold onto Nolan Reimold’s throw, and it rolled all the way to the wall in foul territory beyond third. That allowed the second run to score, which gave the Rangers the go-ahead run. Matt Wieters: 3 for 4, 1 HR. He and J.J. Hardy brought home the only Orioles runs with solo shots. Hardy’s led off the game. Nelson Cruz: 2 for 4. His RBI put the Rangers on the board for the first time in the sixth. Moving the Needle: Erick Aybar doubles home a run, +.132 WPA. 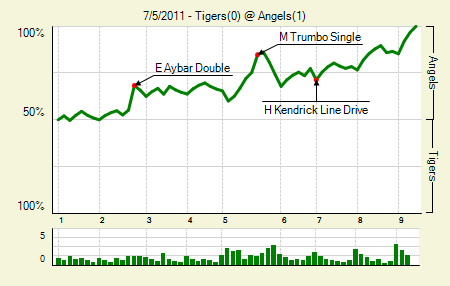 The Angels broke through only once, and it came in the second inning. Howie Kendrick hit an infield single, and Aybar followed it up with a shot past Victor Martinez at first. The play got a little tricky, as Kendrick rounded third while the ball was thrown in to second. Had the throw gone home it probably would have beat Kendrick, but apparently — and I’m trusting the announcers on this one — the third base coach wouldn’t have sent him if the throw hadn’t gone to second. In any case, it was the game’s only run, as both starting pitchers worked their mojos. Dan Haren: 9 IP, 2 H, 0 R, 0 BB, 9 K. He retired the final 15 batters he faced. Three of his strikeouts came on dropped third strikes, and one man reached because of it. Justin Verlander: 7.2 IP, 7 H, 1 R, 2 BB, 8 K. He’s gone at least seven innings in his last eight starts, allowing just six runs in that span. Moving the Needle: Derek Lowe helps his own cause with a bases-clearing double, +.204 WPA. It seemed like one of those, “oh great,” moments. The Braves turned Chipper Jones’s fourth-inning leadoff double into a bases-loaded, two out situation, but had the pitcher coming to the plate. Lowe quickly fell behind 0-2, but stuck around for a while and eventually grounded one hard down the third base line. It went all the way into the left field corner, allowing all three base runners to score and giving the Braves a 4-0 lead. The Rickies would put some on the board in the next couple of innings, getting as close as 4-3, but the Braves got some insurance later on. Freddie Freeman: 1 for 3, 1 HR, 1 BB. That’s three homers in his last two games, and six homers since June 17th. Dan Uggla: 2 for 2, 1 2B, 1 HR, 2 BB. He does have four homers in his last 13 games, so maybe there’s some normalcy being restored. Of course, it’ll take more than normalcy to get his numbers back p to speed. 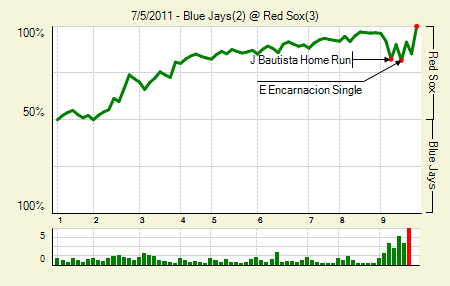 Moving the Needle: Jose Bautista finally gets the Jays on the board with a homer, +.097 WPA. The Red Sox jumped out to an early 3-0 lead, grabbing a pair in the second and one in the third. Everything looked bright at that point, as starter Jon Lester was cruising along. But he left after four with a strained lat muscle. The Jays didn’t get a hit until the sixth, which of course came off the bat of Bautista. It wasn’t until the ninth that they actually scored, with Corey Patterson singling and Bautista hitting one off the tower near the foul pole in left. The Jays then put runners on first and second with two outs, and after John McDonald singled to left, the relay throw beat Edwin Encarnacion to the plate, but it appeared he touched it before Jason Varitek could apply the tag. No matter, though. the home plate ump called him out, and that was the end of that. Brett Cecil: 8 IP, 7 H, 3 R, 2 BB, 6 K. Four of the hits and all three runs came in the second and third innings. Other than that he was spectacular. Dustin Pedroia: 1 for 4, 1 HR. He and Ben Zobrist are tied at 4.1 WAR, which leads all second basemen. 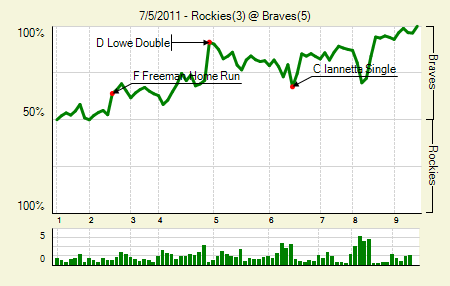 Moving the Needle: Raul Ibanez singles home the first two in a big third inning, +.183 WPA. After two scoreless innings, the Phillies lit up the scoreboard in the third. With a man on first and two outs they got a single, intentional walk, and then four straight singles, which brought home five runs total. 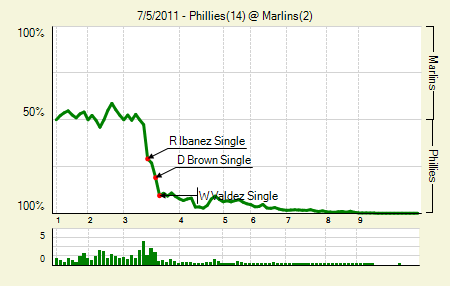 The first two came off the bat of Ibanez, whose liner to center brought home two. Ibanez also capped the scoring, hitting a two-run homer in the ninth. Ryan Howard: 4 for 5, 1 2B, 1 HR, 1 BB. He drove in four, as did Ibanez. Cole Hamels: 8 IP, 8 H, 2 R, 1 BB, 5 K. This was basically a replica of his start two outings ago against Oakland. He might have done it against Boston, too, if not for the injured hand. Moving the Needle: Matt Treanor’s two-out single brings home a pair to break the tie, +.238 WPA. 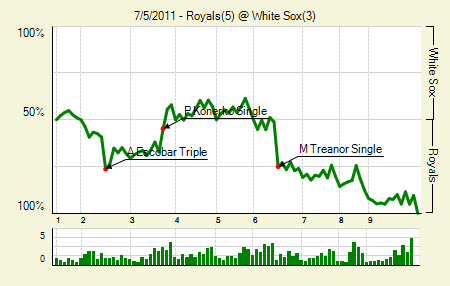 The White Sox spoiled the Royals’ early 3-0 lead, but the Royals had a little fight left in them. Two singles and a wild pitch put runners on second and third with two outs in the sixth, and Treanor brought them both home with a grounder between short and third. The Sox put men on every innings from then on, but couldn’t bring around any to score. Paul Konerko: 3 for 5, 1 HR. He drove in two. Alcides Escobar: 2 for 4, 1 3B. He also drove in two. Moving the Needle: Carlos Beltran knocks home the first two with a homer, +.254 WPA. The Mets scored 100% of their runs in this off the homer. The first came from Beltran, who hit a two-run shot deep to center (approaching left-center). The homer opened the scoring at 2-0. They’d get two more homers later in the game, from a surprising, and welcome, source. Jason Bay: 2 for 4, 2 HR. Not all is well with him yet; for instance, he hasn’t hit a double since May 19th (though he does have a triple in there). But since June 15th he’s hit .338/.400/.456 in 75 PA. The numbers are still not what you’d expect from Bay in the power department, but this is one of his more productive stretches as a Met. Mike Pelfrey: 6 IP, 5 H, 0 R, 2 BB, 2 K. It wasn’t pretty, but Pelfrey got the job done. The box score has him down for eight line drives. I wonder how hard they all were hit. 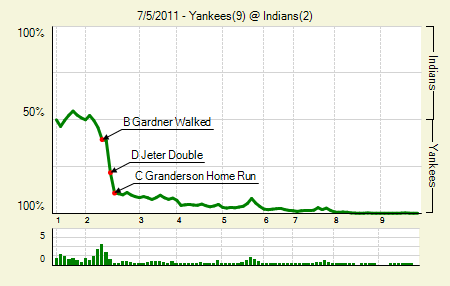 Moving the Needle: Derek Jeter’s two run double opens up a 3-0 lead, +.172 WPA. In order to appreciate Jeter’s double, we need to rewind one batter. Francisco Cervelli came up with the bases loaded and one out, and hit a double play ball to short. The Indians got the runner at second, but Cord Phelps bounced the throw to Carlos Santana, who could not hold on. As was the case when the Yankees failed to catch a pop-up in the previous game, this play came back to haunt the Indians. Jeter worked the count 2-0 and then crushed one deep into the left-center field gap, bringing home the two remaining base runners. The Yanks would put up a five spot in the inning. Eight of the nine Yankees starters had two or more hits in the game. CC Sabathia: 7 IP, 5 H, 0 R, 2 BB, 11 K. After striking out 84 in his first 114 IP (16 starts), he has struck out 33 in his last 22.2 IP (3 starts). Curtis Granderson: 3 for 6, 2 HR. He keeps hitting ’em, but it’s tough to keep up with Bautista, who is now ahead by three. Moving the Needle: Miguel Montero comes through with a bases-loaded single, +.137 WPA. 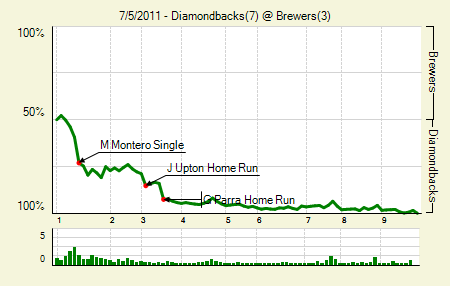 First inning runs are always a big boost, so the Diamondbacks picked up four of them. It started with a pair of singles and a walk to load the bases. Montero then popped one over the second baseman’s head for a two-run single, giving his team an early lead. An RBI ground out and another single capped the first inning rally for the Diamondbacks. They’d pick up another three in the third to give themselves a more than comfortable lead. Zach Duke: 7 IP, 5 H, 2 R, 2 BB, 1 K. That’s his third start of seven innings this year, in which he’s gone 21 IP, 17 H, 3 R, 3 BB, 6 K. He has a 5.40 ERA, so you can figure out how the rest have gone. He does, however, have a 3.43 FIP and 3.91 xFIP, despite a 5.00 K/9. Justin Upton: 2 for 4, 1 HR. Forget All-Star snubs, Upton is a huge Home Run Derby snub. Moving the Needle: Michael Cuddyer’s flare gets by Joyce and brings home a pair, +.171 WPA. 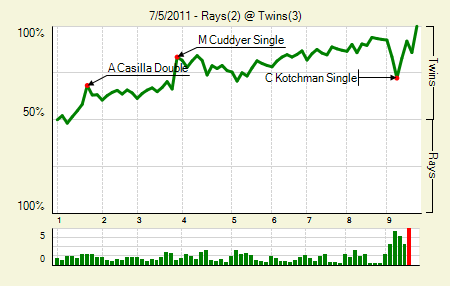 Cuddyer actually brought home all three runs for the Twins, even if he’s credited with just two RBI. A ground out in the first brought home the first run, and then a flare out to right in the third brought home the next two. It could have been only one, since there were runners on first and second, but Matt Joyce whiffed when trying to field it and it got behind him. The Rays battled back, but couldn’t finish the the rally. Ben Zobrist: 3 for 4, 1 2B. He scored a run, but didn’t have men on base to drive in. Scott Baker: 5 IP, 3 H, 1 R, 1 BB, 3 K. He left after five with what is being termed a mild elbow strain. No matter how mild, that’s something no one affiliated with the Twins wants to hear. 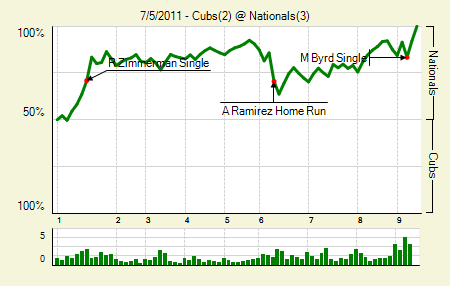 Moving the Needle: Aramis Ramirez homers to bring the Cubs close, +.153 WPA. The Nats jumped out to a 3-0 lead in the first, leaving the Cubs trailing the entire game. They made their move in the sixth, though, getting a leadoff double and then Ramirez’s home run to make it 3-2. Geovany Soto followed that with a double, but the Cubs could not capitalize on two chances with a runner in scoring position. They got a couple of singles the rest of the way, but made no serious threat. Ross Detwiler: 5.1 IP, 4 H, 2 R, 0 BB, 1 K. He showed some strikeout skills early in his minor league career, but injuries have derailed him. He has struck out just 5 per nine in his 111.2 big league innings. Danny Espinosa: 2 for 3, 1 BB. 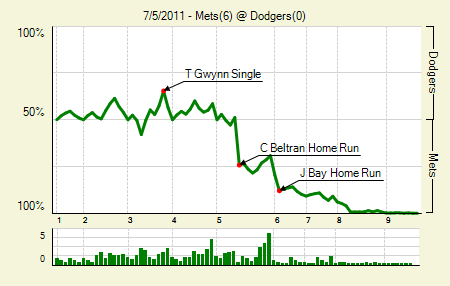 Moving the Needle: Cliff Pennington’s throwing error costs the A’s in extras, -.262 WPA. You can’t assume the double play, but that’s still an error. WIth runners on first and second with one out and the game tied at two in the 10th, Brendan Ryan hit a double play ball to second. Jemile Weeks flipped it to Pennington for the first out, but Pennington’s relay was way off line. It appeared that Ryan might have beat it out anyway, but that’s of little importance. The error allowed the runner from second to score the go-ahead run, which led the Mariners to victory. Felix Hernandez: 8 IP, 4 H, 1 R, 0 BB, 10 K. It was the typical Felix start, right down to his offense providing little support and his bullpen blowing it. Kurt Suzuki: 2 for 4, 1 HR. His solo blast was all the A’s got off Felix. 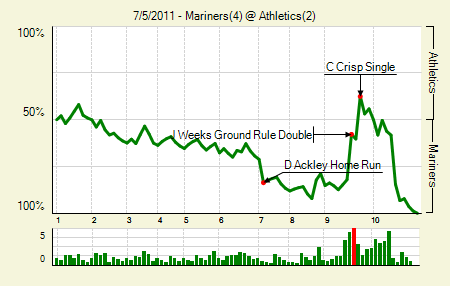 Dustin Ackley: 2 for 3, 1 HR, 1 BB. The kid has made it hard not to like him so far. He’s 15 for 50 with a double, two triples, and three homers in his short career. Moving the Needle: Brandon Wood homers home a pair, +.177 WPA. I am incredibly happy that Wood, one of the most egregious prospect busts in recent memory, made the top WPA play here. The MLB.com video calls his homer a wallop, and I can’t disagree. 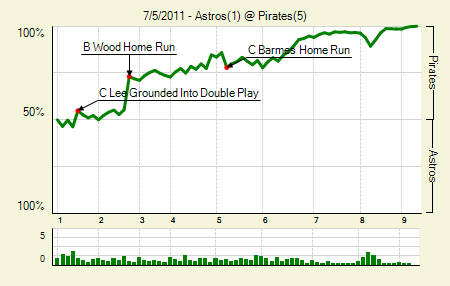 It went way out to right-center, giving the Pirate a 2-0 lead in the second. He also drove in a run later in the game. Jeff Karstens: 7 IP, 7 H, 1 R, 0 BB, 3 K. Apparently Karstens stole Charlie Morton’s bag of pixie dust. He’s at least pitched into the seventh in each of his last seven starts, and has allowed just 10 runs in that span. Neil Walker: 2 for 4, 1 2B. He scored twice. 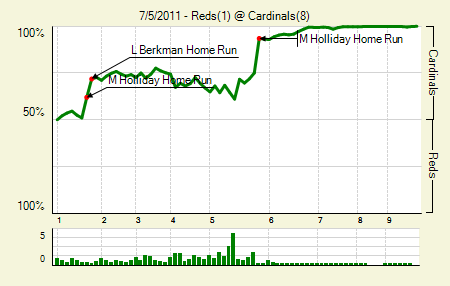 Moving the Needle: Matt Holliday’s second homer opens up the game, +.185 WPA. A Cardinals homer barrage set the tone for this game. They got two of them in the first, one from Holliday and one from Lance Berkman, both solo shots. The Reds picked up one in the fourth, but then in the fifth Holliday struck again, hitting a three-run shot to put the Cardinals up 5-1. They’d add another three in the sixth to seal the game. Jaime Garcia: 6 IP, 2 H, 1 R, 3 BB, 4 K. It’s not Garcia’s best effort, but his offense let him cruise in this one. David Freese: 1 for 3, 1 BB. He’s now 9 for 27 since coming off the DL, but he has just one extra base hit, a double he hit on the 30th. Moving the Needle: Cameron Maybin triples home a pair, +.359 WPA. Down 3-2 after the pitcher broke a 2-2 tie, the Padres struck in the sixth. A double and a walk put two on with two out for Maybin, who hit one into the left-center field gap and all the way to the wall. 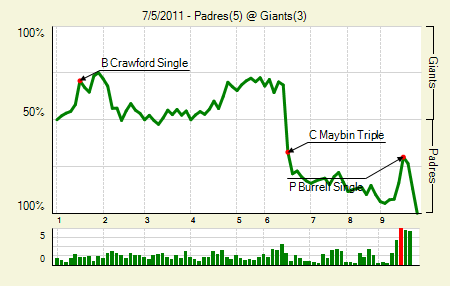 The shot provided more than enough time for both base runners to score and for Maybin to take third. He’d score when Anthony Rizzo singled behind him, giving the Padres a lead that their excellent bullpen could handle. Cameron Maybin: 3 for 4, 1 3B. I usually don’t mention a guy in the notables if he led the Moving the Needle section, but Maybin was clearly the MVP of the game, driving home three runs and accounting for a huge chunk of the Padres offense. Giants offense: 11 H, 0 XBH. All the singles are nice, but unless you string a ton of them together you need those extra base hits for the big innings. We hoped you liked reading The Morning After: Game Recaps for July 5th by Joe Pawlikowski! Except of course for the 4 he’d hit in the previous week including 3 straight on the weekend. I think what he meant was that the Blue Jays had finally broken through and scored in the game. In fact, I’m fairly certain that’s what he meant. I don’t understand comments like this. Do you really think that someone who writes for a baseball site needs to be educated about Bautista? I thought it was sarcasm. Like “mired in a year long slump, Bautista finally broke through”.